Born in Geneva on the 9th may 1941, the Swiss composer Gérard Zinsstag distinguishes himself by the variety of his formations and professional activities. He studied flute and chamber music in Geneva, Paris and Siena, and composition in Zurich and Hanover. After leading an itinerant life across Europe he joined the flute section of the Tonhalle Orchester Zurich in 1967. From which he resigns in 1975 to begin studies of composition under the tuition of Hans Ulrich Lehmann, at whose advice he goes to Helmut Lachenmann for further studies - thus becoming one of his first private students of the German composer. During the summer of 1976 and 1978 he takes part in the International Summer Courses of Darmstadt. In 1979 he stays in San Francisco, being invited by his fellow composer Richard Felciano to speak about his works at Berkeley University. In the same year his work Foris, for two orchestras, is premiered in Donaueschingen, an event that launched his career as composer and firmly established his position in the European music scene. In 1981 he is given a grant by the DAAD to stay in Berlin, where he meets Gérard Grisey, a beneficiary of the same grant. Back from Berlin he goes to Paris, where takes part in courses at the IRCAM. In 1983 he stays for a short period in New York. In 1986, in order to give new momentum to the inert Swiss music scene, he and Thomas Kessler found the first Swiss festival for contemporary music Tage für Neue Musik Zurich. In 1991 he receives a grant by the City Council of Zurich to follow his personal career as a composer. In 1990 his is invited as a special guest, together with the polish composer Zygmunt Krauze, at the festival Spring of Leningrad. In 1994 Edison Denisov invites him to the Tchaikovsky Conservatory to give several lectures and on the same occasion a concert is devoted to his works. 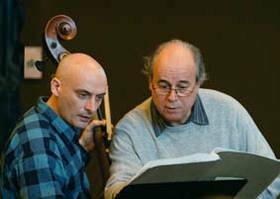 During this period he befriends the composer of the Moscow music scene Wladimir Tarnopolsky, who, thanks to his ensemble CCMM, offers him many times the possibility for the execution of several of his works, recently in October 2014. Principal works: three string quartets ; Ubu Cocu, an opera ; Gilgamesh, music to the ancient epic tale of the same name; several orchestral works, with soloist or without ; pieces for ensemble of various sizes and formations, lately sometimes including electronics ; solo pieces (see list of works). His works have been played by well known orchestras in Hamburg, Stuttgart, Berlin, Mannheim, Baden-Baden, Paris, Moscow, Vienna, Geneva, Zurich, Basle, as well as by European ensembles like Contrechamps, InterContemporain, 2e2m, l’Itinéraire, Athelas Sinfonietta, Lemniscate, Ex Novo, Court-Circuit, Klangforum, Divertimento Ensemble etc. Gérard Zinsstag lives alternately in Zurich and in Villeneuve-les-Avignon.